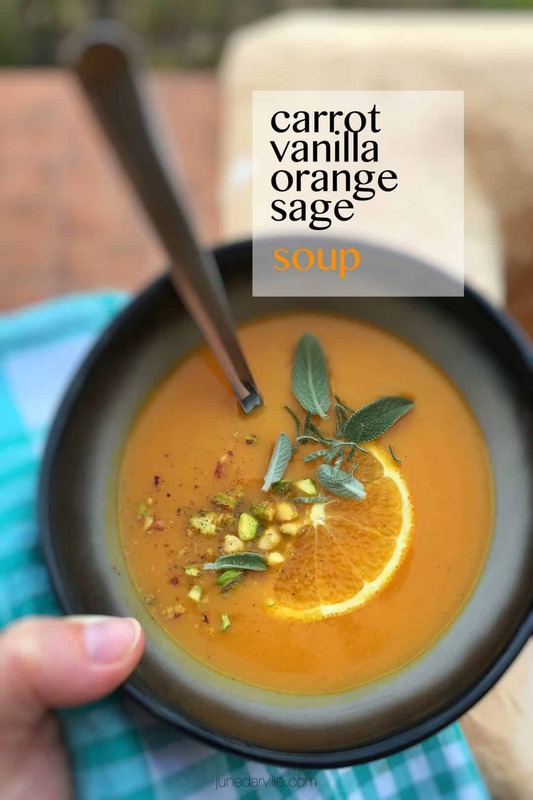 Carrot Soup with Orange, Vanilla & Fresh Sage | Simple. Tasty. Good. 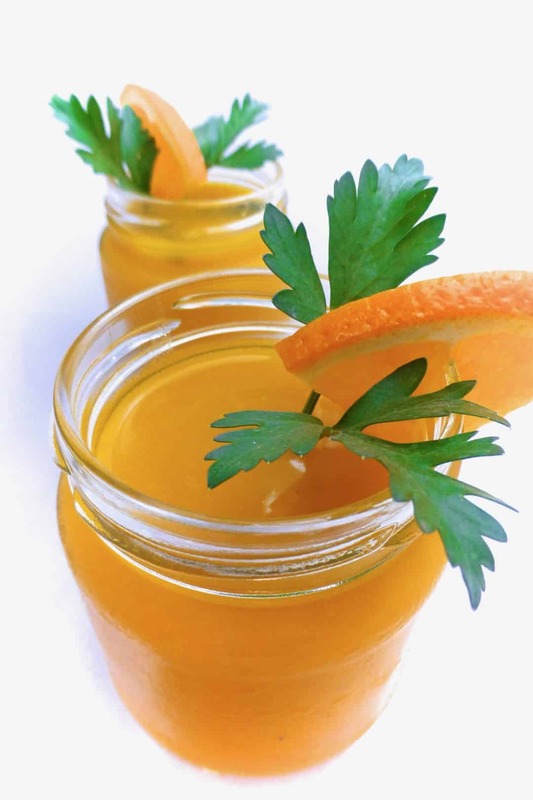 Here’s a quick carrot soup recipe with a surprising twist! Have you ever thought of adding orange zest to it? Why, because those 2 flavors go extremely well together, believe me! I ordered a bowl of carrot soup in Marrakech, Morocco for lunch once when I was visiting and I was totally blown away by that extra zesty flavor. Ka-ching, another interesting idea to add to my soup recipes collection! But I added my own little flavor touch: vanilla and sage! Right, vanilla. Odd ingredient maybe for a soup but it just tastes so damn right in this soup here. Try it and you’ll see what I’m talking about. 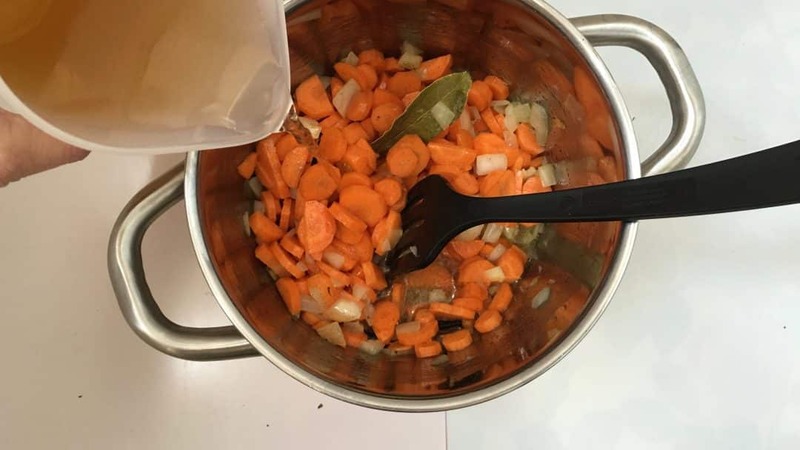 I made a carrot salad with vanilla some time ago, you can find that one below this carrot soup recipe: check it out as well! Another cool thing about this carrot soup: you can serve it warm and chilled! The first fresh batch I made of this carrot soup we ate hot as a little starter before a lamb dinner. I put what was left of the carrot soup in the fridge for lunch a day later. Wow, both hit home. What an amazing flavor! Also check out another amazing carrot soup: my silky smooth carrot and pumpkin soup with delicious grilled cheese and ham sandwiches! I made this carrot soup twice: once over the stove and a second time in my fabulous KitchenAid Cook Processor! For the KitchenAid Cook Processor recipe: scroll down to the second carrot soup recipe! Watch how I’m preparing a velvety carrot soup with vanilla and orange in my fabulous KitchenAid Cook Processor! Peel and chop up the yellow onion and the garlic cloves. Add them to a large pan together with the olive oil, the bay leaf and the ½ vanilla bean (slice it in half lengthwise first). Place the pan over medium heat and stir fry the onion and garlic in the hot oil for 5 minutes. In the meantime peel the carrots and slice them up finely. Add them to the onions. Pour in the vegetable or chicken stock. Season with a good pinch of pepper. Slice the fresh orange in half and add it to the soup together with the fresh sage. Bring the carrot soup to a rolling boil and then turn the heat lower. 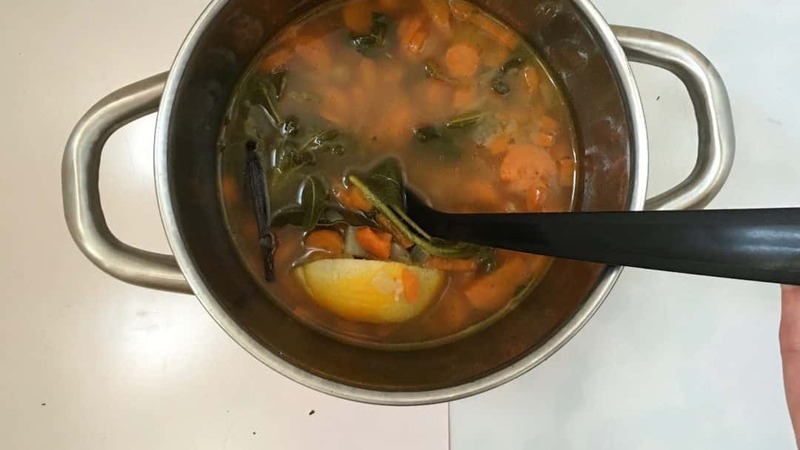 Put a lid on the pan and cook the carrot soup for 30 minutes until all of the ingredients are soft and smooth. Remove the vanilla bean, the bay leaf and the sage. 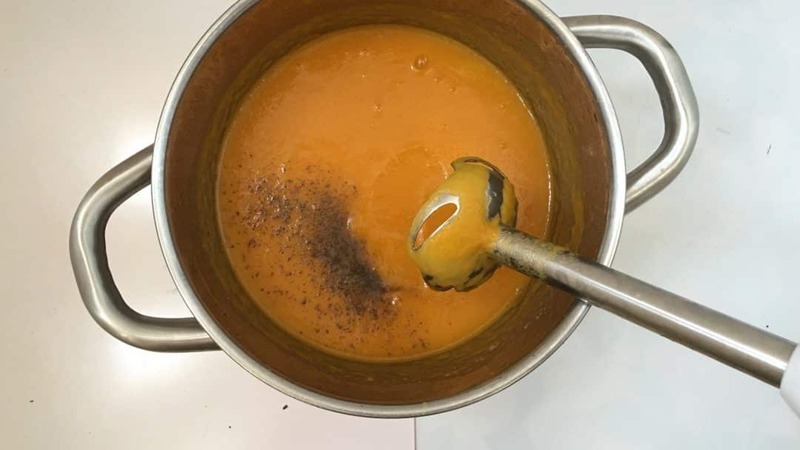 Mix or blend the soup until it is silky smooth. Add the unsalted butter. Mix or blend the carrot well again. Check the seasoning of the carrot soup and add extra pepper and salt to taste if necessary. Scoop the soup into bowls and garnish with the crushed pistachio nuts. If you are serving the soup cold, let it cool down fully in the fridge and serve with the pistachio nuts. Watch how I prepare a zesty creamy carrot soup with oranges and vanilla in my fabulous KitchenAid Cook Processor!! 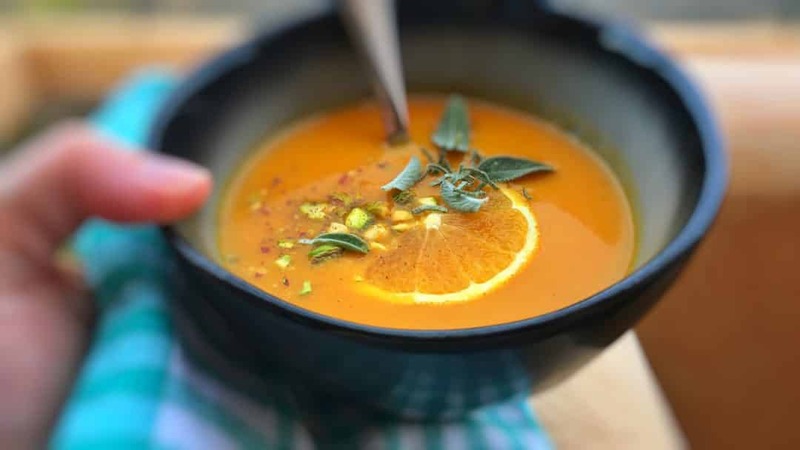 Orange, vanilla and sage... most surprising flavors for this carrot soup recipe - it really works! Served hot or chilled: your choice! Peel the yellow onion, the carrots, orange and the garlic cloves. Add them to the bowl of the Cook Processor fitted with the MultiBlade. Close the lid and press Pulse for 10 seconds. The vegetables should be roughly chopped up. 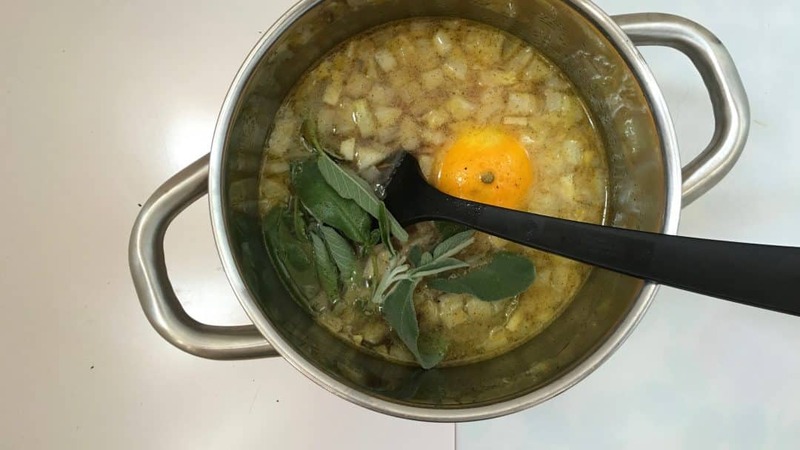 Scrape down the sides of the bowl and add the water, the bouillon cube, the fresh sage, the olive oil, the bay leaves and the vanilla bean (slice it in half lengthwise first). Season with a pinch of pepper and salt. Close the lid of the bowl and select BOIL P1. Press Start to activate the program. 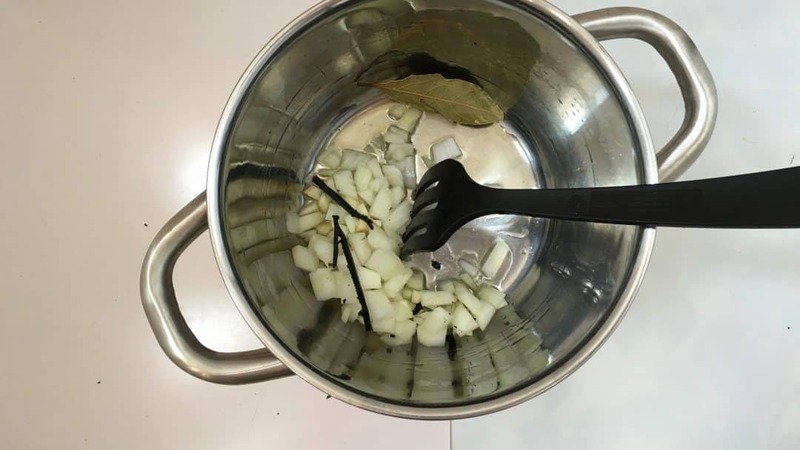 After that, remove the vanilla bean, the bay leaves and the sage. Add the unsalted butter to the soup. Close the lid of the bowl and press Pulse for 20 seconds. 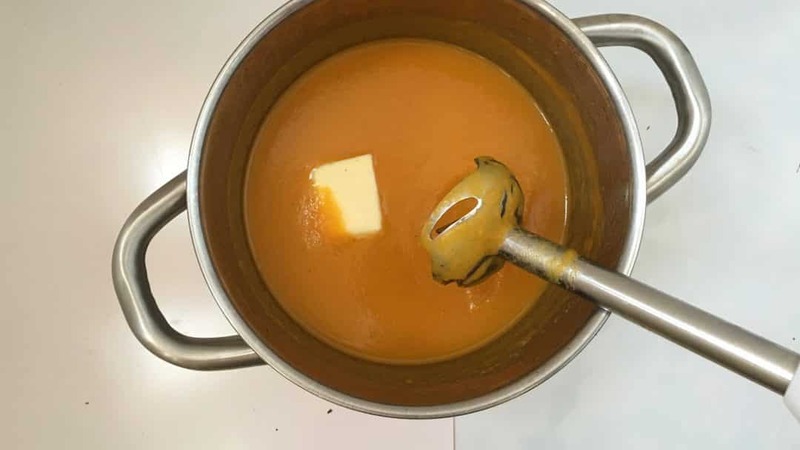 Blend the soup until it is silky smooth. Check the seasoning of the carrot soup and add extra pepper and salt to taste if necessary. Scoop the soup into bowls and garnish with the crushed pistachio nuts. If you are serving the soup cold, let it cool down fully in the fridge and serve with the pistachio nuts. I have this health freak friend who is enormously prejudicial to all foods if it doesn’t wear the label of organic, fat free, sugar free and from time to time even vegan… you name it. You probably know someone like that too. But! Whenever my friend comes along for dinner parties or lunch I take it as a challenge to come up with something cool. I had this bunch of fresh carrots left that I bought at the farmers market so I decided that this would be my main ingredient. I went for a chilled carrot soup with a hint of orange that I served as a little starter drink to go by a grilled chicken lunch salad. Add ice cubes to it if you like! Make sure that the carrot soup is as smooth and runny as can be. You should be able to drink it just like that, no spoon needed. Peel and trim the fresh carrots. Chop them into smaller chunks. Peel the garlic cloves as well and add them together with the carrots to a large baking dish. Then sprinkle the vegetables with a little dash of pepper and salt. Add a drizzle of olive oil as well. Stir the carrots well and put them in a preheated oven at 400°F (200°C). Roast the carrots for about an hour. Stir them once after 30 minutes. Then turn the oven off and let the carrots rest in the hot oven for another hour. Then transfer the roasted carrots and garlic to a large saucepan and add the vegetable stock. Bring this to a boil. Once boiling, add the orange slice and cover the pan with a lid. Cook the carrots and orange for another 5 minutes. Then let it all cool down again. 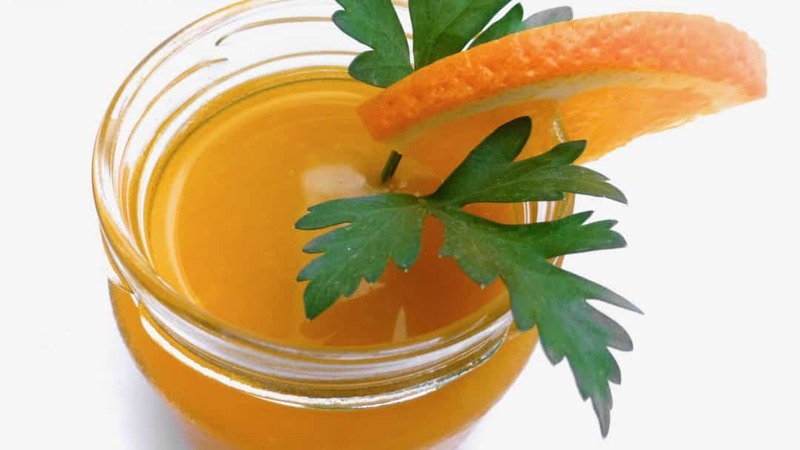 Once the carrots are cold again, pour it all in a clean blender. Blend into a very fine carrot soup for about a minute. Make sure there are no chunks anymore. Then pour the soup through a fine colander or sieve into another bowl or pan. Stir and press the remaining carrot pulp using a spoon or spatula until all the liquid is drained. Then check the seasoning of the remaining carrot soup and add extra pepper or salt to taste if necessary. Chill the soup in the fridge for an hour. Serve. Yep absolutely. No carrot soup this time but a vanilla and carrot salad recipe is what I’m talking about here. You might ask yourself how on earth I came up with the idea to add a freakin’ vanilla bean to a hearty side salad. Sure these are far more hotter in dessert preparations and other sweet stuff like that. But in a salad? Hey well, nothing wrong with living on a culinary edge! Sure the vanilla bean really stands out here. 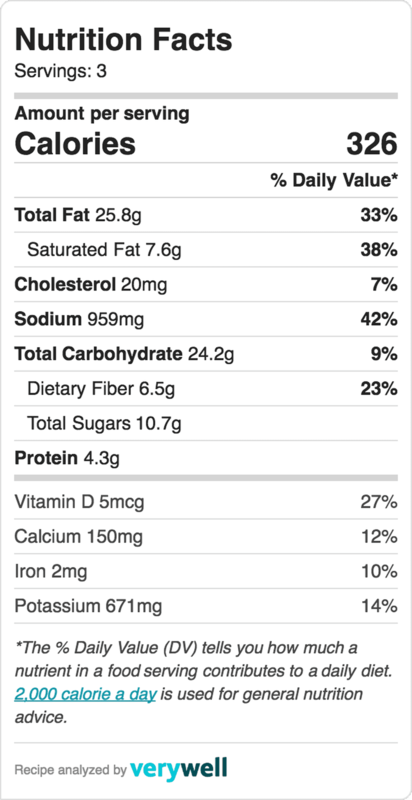 I mean the combination with the sweetness of the carrots is spot on. 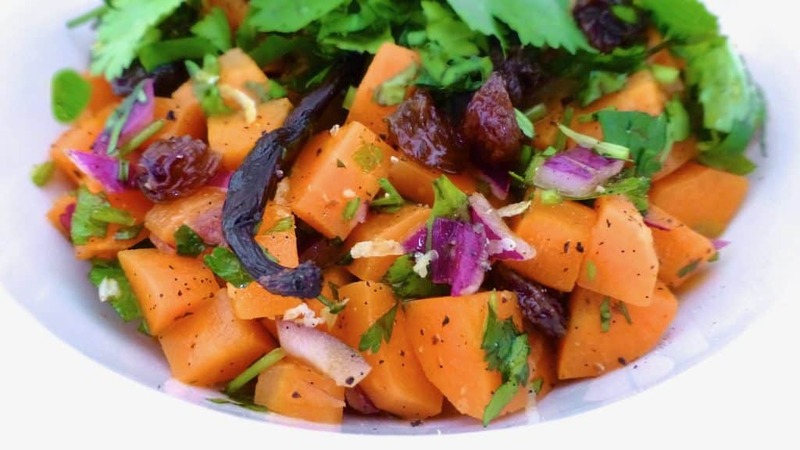 But credits for this wonderful carrot salad also go to flavors such as: fresh lemon juice and zest, raisins, red onion and (hell yeah) the freshly chopped cilantro. Try it. You’ll see it really makes sense. I served the salad as a side for baked sea bass stuffed with wild fennel and boiled potatoes in their skins. A wonderful carrot salad with flavors such as lemon juice and zest, raisins, vanilla and fresh cilantro! Soak the raisins in a little water while you prepare the salad. Peel the garlic clove and mash it finely under the blade of your knife. Pour a splash of olive oil in a medium non-stick pan and then place it over medium heat. Add the mashed garlic. Gently cook the garlic for 2 minutes without browning. Don’t burn it! Peel the carrots and chop them up. Add them to the cooked garlic. Season with a pinch of pepper and salt. Stir the carrots well and cook them in the hot oil for 2 minutes. Slice the vanilla bean in half and scrape out the black vanilla seeds. Add both the black vanilla seeds and the sliced vanilla bean to the carrots. Stir the ingredients and cook for another 5 to 6 minutes. Stir regularly. Then add the lemon juice and the lemon zest to the pan. Cook for another 2 minutes. Check the tenderness of the carrots. They should still be a little crunchy. Take the pan off the heat and stir in the chopped red onion. Stir and check the seasoning. Add extra pepper, salt or lemon juice to taste if necessary. Stir in the chopped cilantro and the handful of (drained) raisins. Let the carrot salad cool down fully. Serve at room temperature.